Wallace Heaton was a distributor of photographic products in London from 1917 to 1972. The company was founded by Wallace Evans Heaton. Heaton became interested in photography while working in a pharmacy on Bond street in London but eventually shifted his business from a pharmacy (a Chemist shop in local jargon) located in Brighton in the late 1800s. In 1902 Heaton opened a photographic business in Sheffield called Watsons of High Street. In 1919, Heaton moved his business to 119 New Bond Street in London and renamed it to Wallace Heaton, Ltd. In 1972, the company was bought by Dixons Retail plc, a consumer electronics retailer in Europe. The company distributed products made by other companies, including some that were rebadged under their own brand names, Zodel, Zodellar, and Harmony. Wallace Heaton was the official supplier of photographic gear to the British Royal family as well as being the "Royal Photographers". 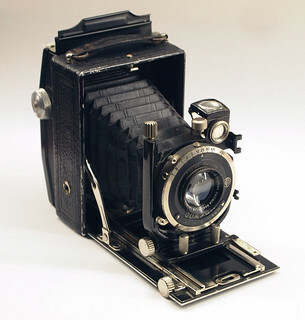 The company is best know for publishing an annual catalog of photographic gear. These catalogs, known as Blue Books because of their blue covers, were published annually between 1949 and 1972. Blue Books are highly sought after by collectors because of the valuable information they contain about a wide range of cameras made during those years. ↑ Where the Queen Mother shops.